A drainage ditch bisects our property. It was dug many years ago to drain the east fields. I think of drainage ditches as long barren gouges in the ground for removing excess surface water to keep fields dry and plantable. In my mind, ditches are lined with rocks or even culverts. They can be wet or dry depending on rainfall and snowmelt. When I was a kid in suburbia, there was a huge drainage ditch under a nearby highway where several hills converged. One of our great adventures was to explore that eight foot diameter tunnel of concrete, all the way to the end where the light was poor, the trickle of water threatening, and the possibility that the shape lying on the floor was a dead rat was electrifying. That was a drainage ditch. After 40 some years, our drainage ditch has become a stream. Even this spring with very little winter or spring precipitation, water runs through it. Our grandsons slide along its icy path in winter. They slog their way through boot stealing mud at the end of summer when much of the stream is dry. Gnarled willow trees crowd the banks in places, walnut trees line the field edge, wild grasses fill the spaces in between. A simple wooden bridge crosses the stream. It’s still a drainage ditch, but to me it’s a stream. Just a matter of point of view. This spring I realized that the same thing is true of Creeping Charlie, also known as ground ivy, a ground cover that is rapidly taking over our woods and lawn. For years we have struggled to keep it out of our gardens. It is particularly happy in shady places – under the lilac hedge, around the pond, up the driveway, in the lily bed. We’ve tried spraying with herbicides, but that kills the violets that bloom in the lawn. We’ve tried weeding, but every piece of ground ivy stem or root that remains in the ground just grows another plant. We’ve tried ignoring it and hoping that a more robust plant will overwhelm it, but especially in the lawn, nothing handles foot traffic as well as Creeping Charlie, not even grass. So I fret about the lawn, the gardens, the woods. Our daughter Laurel loved the wretched plant because it reminded her of her Grandpa Charlie and had intricate little purple flowers. She always pushed and attitude of acceptance. Dave kept three bee colonies alive through last winter and they were full of hungry bees well before most flowers bloomed this spring. That’s when I realized that Creeping Charlie, that noxious weed, wasn’t completely evil. Both bumble bees and honey bees love the tiny purple flowers that began to bloom before the elderberry and the same day as the dandelions (another noxious weed) - almost the first flowers of spring. 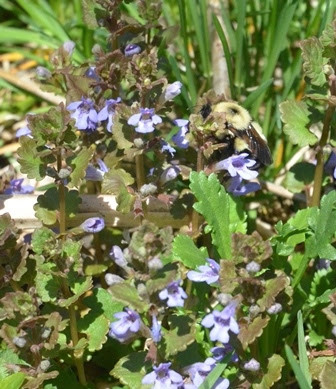 The ground ivy will keep the bees going until warm weather and spring rains bring other blossoms. I can certainly set aside my enmity for Creeping Charlie in exchange for more honey. It’s all in point of view.